Frac sand demand in the Permian Basin is evolving, even from what it was just a few short years ago. Now with more crude oil takeaway capacity planned for the area, production is projected to continue to climb, which will no doubt continue to drive the ever-changing proppant demand landscape. Let’s take a look at Permian Basin frac sand demand by the numbers, but first, a little background. The name “frac sand” is derived from its use in hydraulic fracturing, or fracking, which is a common well completion method used to unlock natural gas, natural gas liquids, and crude oil from unconventional reservoirs such as shale. Water is injected under very high pressure into the well which forces small fissures in the rock formation into larger fractures. Frac sand is then injected to prop these fractures open, which is why frac sand is also called a proppant. Frac sand props open fractures in the shale formation, thus releasing the hydrocarbons. Now for the numbers. 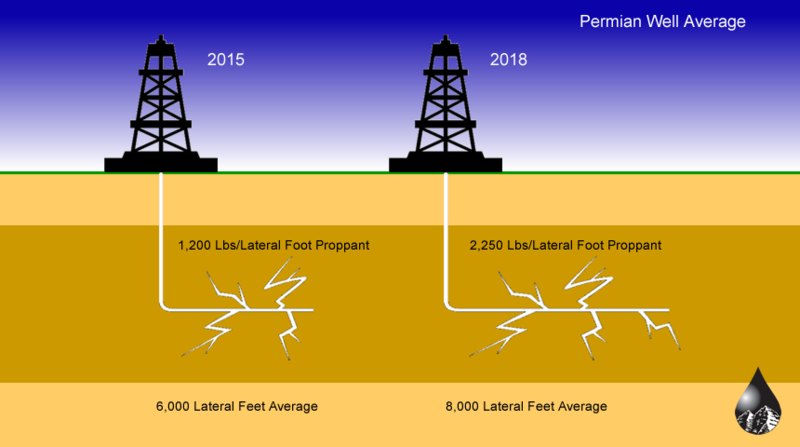 In 2015, the average well in the Permian Basin had a lateral (horizontal) length of approximately 6,000 feet and used approximately 1,200 pounds of proppant per lateral foot. Today, wells in the Permian have increased in lateral length to an average of 8,000 feet and now use a staggering 2,250 pounds of frac sand per lateral foot on average. The following chart further illustrates how proppant consumption per lateral foot in the Permian Basin has increased from under 1,000 pounds per lateral foot in 2014 to 2,250 pounds per lateral foot in 2018. 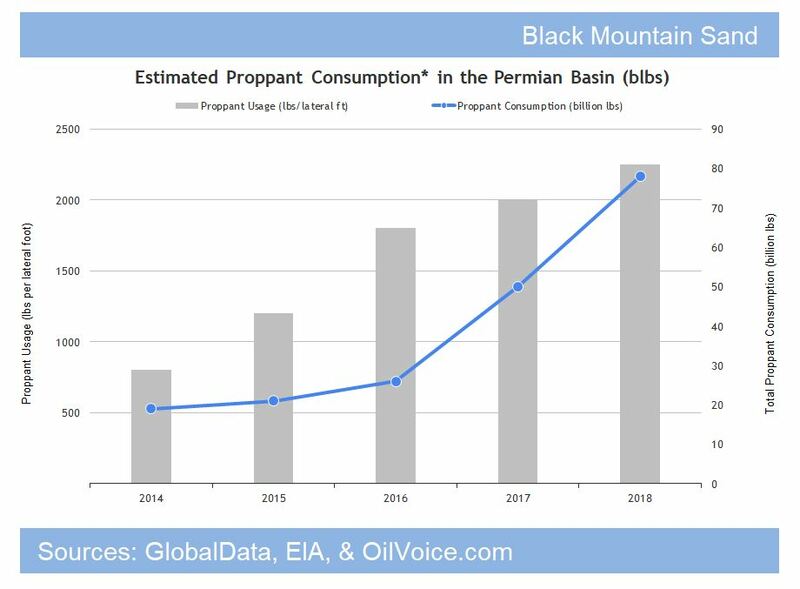 It also shows how total proppant consumption in the Permian has more than doubled from 2014 to 2018, growing from approximately 30 billion pounds to approximately 80 billion pounds. The number of Drilled Uncompleted (DUC) wells continues to rise, reaching 8,389 wells across the major shale basins. According to the EIA, the Permian DUC well inventory far exceeds any other shale play. 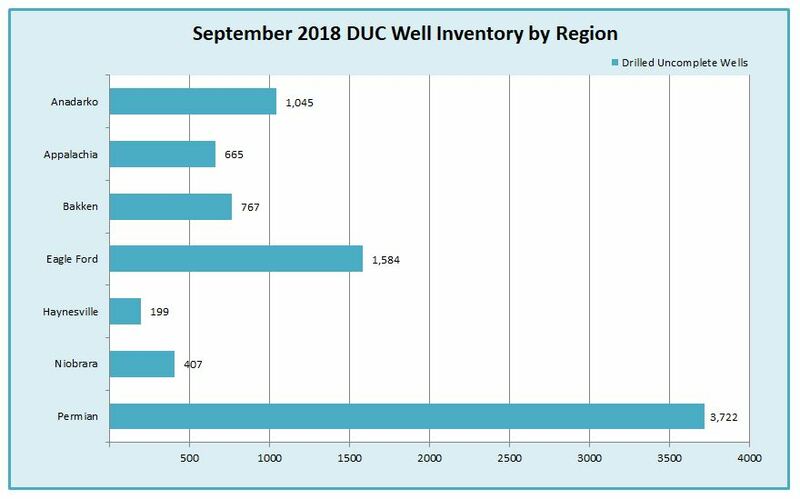 As of September 2018, there are 3,722 DUC wells in the Permian Basin alone. According to the most recent averages of a Permian well at 8,000 lateral feet using 2,250 pounds of frac sand per lateral foot, that equates to an average of 18 million pounds of proppant per well. If that estimate holds true, the demand for frac sand in the Permian Basin alone would be almost 67 billion pounds just to complete all 3,722 DUC wells in inventory. The Permian pipeline infrastructure is a current challenge for the basin. As it exists now, the system has approximately 3.1 million barrels per day of takeaway capacity, but the area produces more than 3.4 million barrels per day. This bottleneck has stunted the growth of crude production as well as frac sand demand. However, that is about to change. There are enough pipeline projects currently underway and on the drawing board to potentially more than double the crude oil takeaway capacity of the Permian Basin. So, what could an additional 3.6 million barrels per day of crude pipeline capacity mean for oil production, the frac sand industry, the oil industry in general, or even the U.S. in the global market? Terms like energy independence and energy dominance come to mind. Since the inception of the use of hydraulic fracturing in the Permian Basin, acquiring quality proppant has been a logistical challenge as well as an expensive endeavor. Operators used frac sand mostly from mines in Wisconsin which had to be shipped by rail to the Permian. Naturally, the freight charges added substantially to the cost of completing a well in the Permian. Today that is changing. 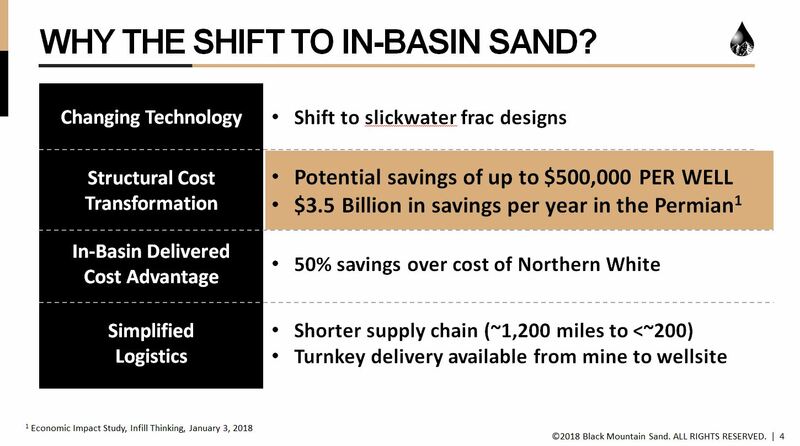 Black Mountain Sand and others have opened in-basin frac sand mines in the Permian and are now supplying sand to operators for lower costs than sand delivered from Northern-based mines. Frac sand delivered from Permian Basin mines saves operators in the neighborhood of $500,000 per well. Recent trends have shown that Permian Basin wells have gotten longer with more proppant used per lateral foot. This fact coupled with the record numbers of DUC wells needing sand for completion, points to a continued rise in frac sand demand. And, with pipelines in the works that could potentially double takeaway capacity in the Permian, a new production boom is on the horizon. Add it all up, and the numbers look very positive for frac sand demand in the Permian Basin. Sharing the Spirit of Giving! Black Mountain Sand is an in-basin frac sand provider delivering superior products and solutions to the E&P industry with both 40/70 and 100 mesh frac sand mining capabilities. ©2018 Black Mountain Sand. All rights reserved.